Many skeletons of the industrial revolution have given way to modern, progressive interests. Where factories once stood now lie casinos, river walks, or corporate-thought office buildings. Turning down particular side streets, however, may carry you straight into some dusty, crumbling haunts that once guaranteed work for the everyman. To many, these eyesores are little more than real estate that just isn't worth the trouble. To others, these vacant mills represent promise and progress that has migrated toward greener pastures. Hamburg, Germany, a hub of transport and culture, paradoxically serves as home to today's featured Sunday Sludge artists, SHAKHTYOR. 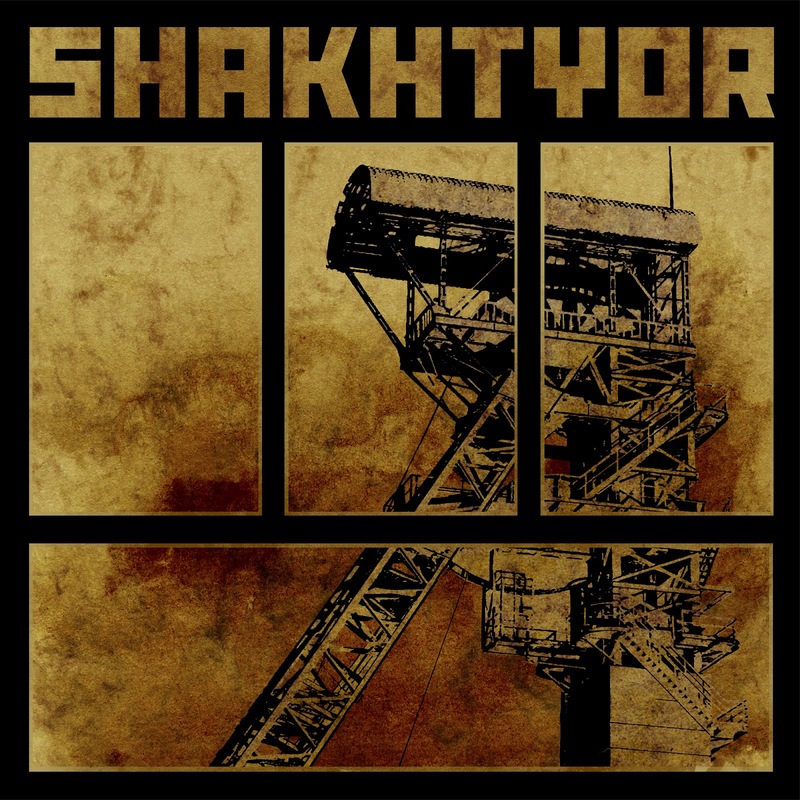 On their self-titled debut album, Shakhtyor instrumentally paint a canvas of desolate, idle communities shackled by their own glimmer of what was once called hope. Four tracks compose this forty-minute history lesson, complete with a staggering blend of sludge, doom, and stoner-metal that sways like loose scaffolding. These songs build, swell, and crumble in a manner that only the most patient of musicians can deliver. The album's opener, E. Jasper, maintains a thick, pensive buzz via distant guitar plucks. Rhythms lumber along cracked streets as the stoner sludge is met with the drone of layered riffs. Shakhtyor know when to relent, but don't think they're doing you any favors. The slow, cool buzz becomes a heavy hover that's sticky with hot tar. Chris takes his guitar licks straight into the cosmos, but he's dragging the muddled, shackled rhythms right behind him. The crunch and clunk of militant boot-heels is the only taper that fits. Nils' drums roll through like slow-moving freight on Handschuhmann, holding a steady stoner tempo with sludge gravity. Drums and fretwork form a parity until a fuzzy rumble weakens your knees. The song evolves into darkness and destruction, burning and blistering the skin of clones in the feeding line. The slow sludge march is peppered with Chrischan's bass trap that pins not only the sound but also the song's entire mood. The album's final tracks demonstrate Shakhtyor's patience with their instruments and confidence in themselves. Пayk PИбa is a foggy foretell of approaching evil, marked by guitar jabs and drum slaps. Slow and cocksure, the rhythm briefly picks up before reclining even further. This smoky roll between shipyards and mines scrapes bone as if we've been thrown into neutral. Keeping low to the ground, the cadence grows under gravel before fluttering and flattening everything all at once. These structures were crumbling anyway. Shakhtyor entered to stop the bleeding and respond to the death knell. The ominous crawl of K.I. employs down-tempo cruising on the back of thick, sticky gravity. Guitars splinter and eject on this steady, heady course through a wasteland of foundries that gave way to technology. Somber tones wallow and warble, finger-painting distress signals with their own thin blood. Atmospheric and, at times, psychedelic, this opus creeps to a tip-toe under devolving sludge. Growing slower, grinding, plodding... This is a sway you just can't steer clear from. It's hard to imagine an instrumental sludge record telling a story or crafting an image. Shakhtyor's debut is riddled with gorgeously haunting imagery that only the most expansive of imaginations could share. You'll actually feel like the Russian miner serving as the band's namesake. The band has stated they never bothered looking for a vocalist. This isn't a "less-is-more" approach; this is an exercise in craftsmanship and artistry so rarely seen because many bands don't have the stones to try. Shakhtyor have all they need.